A rich tapestry of Nile lore and legend, stretching from the ancients to the fall of the latest tyrant. British author Twigger (Dr. Ragab’s Universal Language, 2009, etc.) lived in Cairo for seven years before fleeing the revolution in 2011. Here, the author compiles a vast compendium of drama and history around the attempts to control the Nile. Somewhat chronological but hardly linear, Twigger’s labor of love meanders, much like its subject. History itself began there, in the Great Rift Valley of East Africa, from which emerged not one but three Niles: The Blue Nile rises in Ethiopia; the White in central Africa; and the mighty Red flowing from Lake Victoria (fed by the Kagera River coming down from the so-called Mountains of the Moon, which Twigger maintains is the Nile’s true source) to the Mediterranean Delta. Why is it red? That is the color of the silt, as well as the rare algal bloom known to turn the surface red and kill the fish, which might explain Egypt’s first plague: the “river of blood” Moses created when he struck the surface as dictated by God. 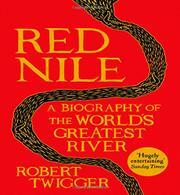 Nonetheless, red is the color of blood, life, violence, passion and revolution, and the Nile delivers each in turn. The earliest inhabitants of the areas around the river were hunter-gatherers who followed the river as the game roamed and probably gave their things away as they moved rather than hoarding what they could not carry. Especially fascinating is the lore surrounding the powerful and dangerous animals that haunt the river and were depicted by ancients as demigods: baboons, hippos and crocodiles. Indeed, the Nile gave birth not only to mad kings and caliphs, from Cleopatra to Hakim, Napoleon to Lord Kitchener, but the theory of blood circulation, understood by Ibn al-Nafis 400 years before William Harvey. A painstaking work of research and careful observation.